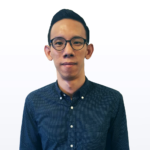 How Does CareShield Life Help Singaporeans? It’s probably not news anymore that our healthcare needs will continue to increase in the near future. With Singapore’s ageing population needing to be taken care of, Government spending on healthcare is expected to go up by at least $3 billion by 2020 from the current levels. But what does this mean for Singaporeans? Simply put, we should start thinking and preparing better for our healthcare needs. Many people might be familiar with the concept of health insurance and Government schemes, such as MediSave and MediShield Life, to help prepare for our healthcare needs. What you might not be aware of is that there is a need to also prepare for Long-Term Care (LTC), the personal and medical care you will need if you become disabled due to age or adverse health conditions. How real is this need? Well, an estimated 1 in 2 healthy Singaporeans aged 65 could become severely disabled before they die. 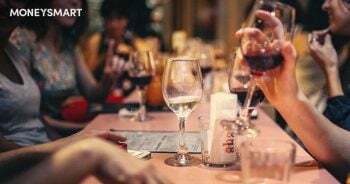 Being severely disabled means we may need help with eating, going to the toilet or walking around, which places a burden on our families or caregivers. Given the uncertainty of long-term care costs and the duration of severely disability should this happen to us, working out how much to save for long-term care can be difficult. To help with the growing needs of long-term care, the Government recently announced CareShield Life, which is a long-term care insurance scheme. 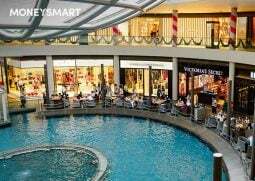 The new scheme will come into effect in 2020, and Singaporeans aged 30 to 40 (born between 1980 to 1990) will be under CareShield Life. From 2021 onwards, Singaporeans born after 1990 will join CareShield Life when they turn 30. Under the new CareShield Life scheme, Tom will join CareShield Life when he turns 30 in 2020. As he is single, his monthly per capita household income (PCHI) of $1,100, Tom will receive premium subsidies of 30%. He will also receive a transitional subsidy of $70 in 2020, and another $180 over the subsequent four years. After all the subsidies, his starting premium is around $6/month. This is around 7% of his monthly MediSave contributions. And yes, Tom can fully pay his premiums through MediSave. 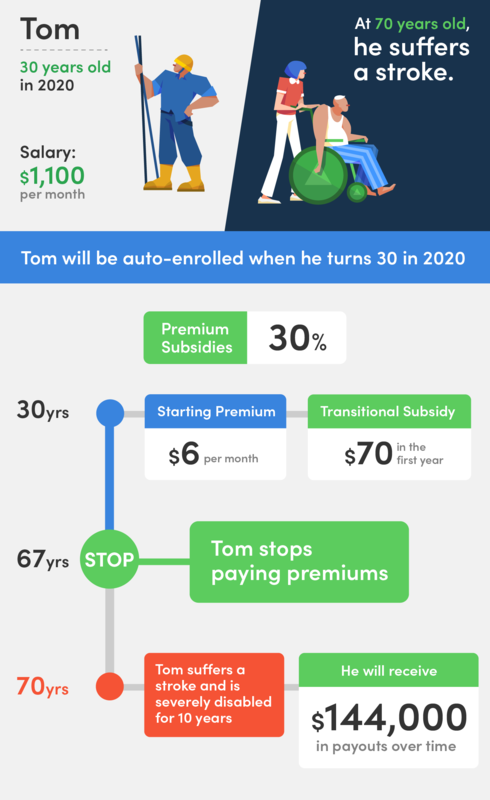 Tom will stop paying premiums at the age of 67, after paying about $7,800 in total. At the age of 70, Tom unfortunately gets a stroke, and remains severely disabled for 10 years till his passing. Tom will receive about $1,200 a month in cash to help cope with his long-term care needs. Over the 10 years, Tom will receive payouts amounting to over $144,000, which is over 18 times the total premiums he paid. For lower-income individuals, Additional Premium Support (APS) is available to help tide over periods of financial instability. APS is designed to help the needy who are unable to afford their CareShield Life premiums even after Government subsidies. This will ensure that no Singapore resident will lose their CareShield Life coverage just because they cannot afford to pay their premiums. 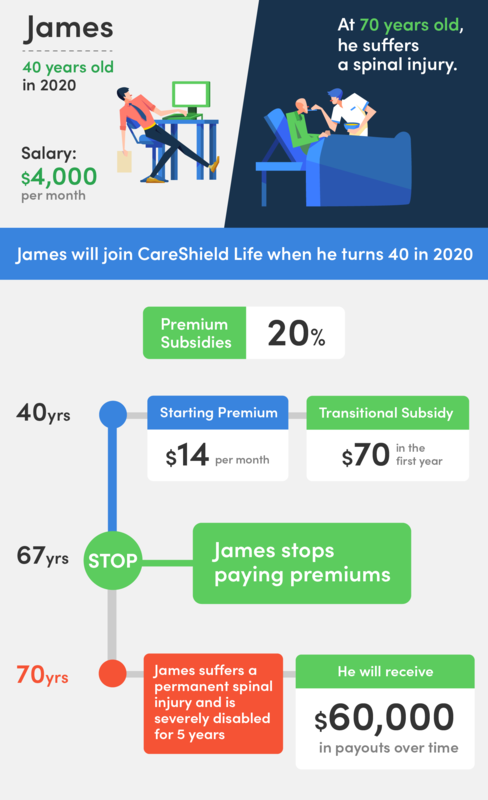 James will join CareShield Life when he turns 40 in 2020. Based on his monthly income of $4,000 and one dependent, James has a PCHI of $2,000 – this means he will receive premium subsidies of 20%. He will also receive a transitional subsidy of $70 in 2020 and another $180 over the subsequent four years. His starting premium is around $14/month, which is about 4% of his monthly MediSave contributions. James will stop paying premiums at the age of 67, after paying about $8,500 in total. James becomes severely disabled for 5 years at age 70 due to a permanent spinal injury. When James was in hospital for treatment for his spinal injury, he made a claim from MediShield Life for his hospitalisation expenses, and could use MediSave to pay for the remainder of his hospital bill. 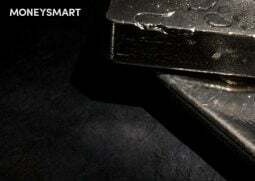 James will receive a monthly payout of $1,000 in cash under CareShield Life. During his 5 years of living with severe disability, James stays in a nursing home, where he will receive further Government subsidies. Over the 5 years, James will receive an estimated total CareShield Life payout of $60,000, which is around 7 times of what he would have paid in premiums. In contrast, if he had been on the current ElderShield 400 plan, he would have paid about $4,600 in premiums and received about $24,000 in payouts, which is only about 5 times what he would have paid in premiums. Similar to James, Sally will be on CareShield Life when she turns 40 in 2020. 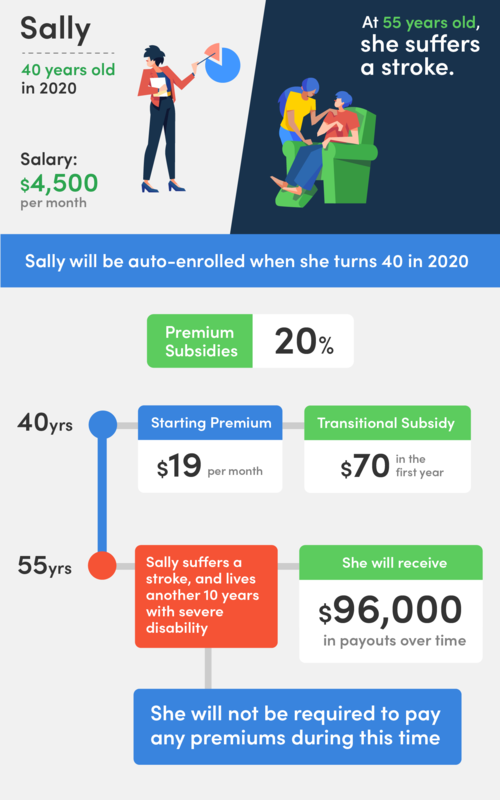 Based on her monthly income of $4,500 and with one dependent, Sally has a per-capita household income of $2,250 – which means she will receive premium subsidies of 20%. She will also receive a transitional subsidy of $70 in 2020 and another $180 over the subsequent four years. Her starting premium is around $19/month, which is about 5% of her monthly MediSave contributions. If she is unable to afford her premiums after subsidies, she can apply for Additional Premium Support from the Government like Tom and James. Sally unfortunately suffers a stroke at age 55, and lives for another 10 years with severe disability. Under CareShield Life, Sally will not be required to pay any premiums and will be eligible for monthly payouts for as long as she remains severely disabled, like Tom and James. Sally’s monthly cash payout from CareShield Life is about $800 a month. Sally is cared for at home, with the support of her immediate family members. The $800 a month goes towards the cost of caring for her at home, which can include paying for medical supplies, home nursing services or hiring a domestic helper who helps her with her daily long-term care needs. Over the 10 years in severe disability, she will receive an estimated total payout of $96,000 from CareShield Life. This is around 18 times what she paid in premiums, which amounts to about $5,200. What About Those Who Are Above 40? Those who are above 40 in 2020 (born 1979 or earlier) can choose to join CareShield Life from 2021 onwards. It’s important to note that previous ElderShield premiums that have been paid will be factored in calculating the upgrade fee. For example, a 50-year-old who currently has ElderShield coverage will pay less to convert to CareShield Life as opposed to someone who had opted-out of ElderShield. The benefits offered by CareShield Life, in terms of the increased length of care and coverage, definitely makes it a worthwhile scheme to consider. Like those 40 and below in 2020, you will also be entitled to premium subsidies of up to 30% of your premiums. On top of that, you can also get between $500 and $2,500 in participation incentives that will offset your annual premiums. Those in financial need and are unable to pay for their premiums can apply for Additional Premium Support from the Government. What are your thoughts on CareShield Life? Share them with us here!